Series BC beam combiners are ideal for applications where diode lasers are being used for system alignment. 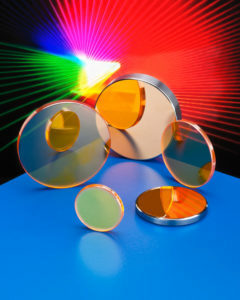 Designed for use at 45 degrees, they transmit the 10.6 micron beam and align it with the 90 degree reflected diode beam. Standard beam combiners are optimized for .633 microns but can also be designed for other diode wavelengths such as .650 and .670 microns.